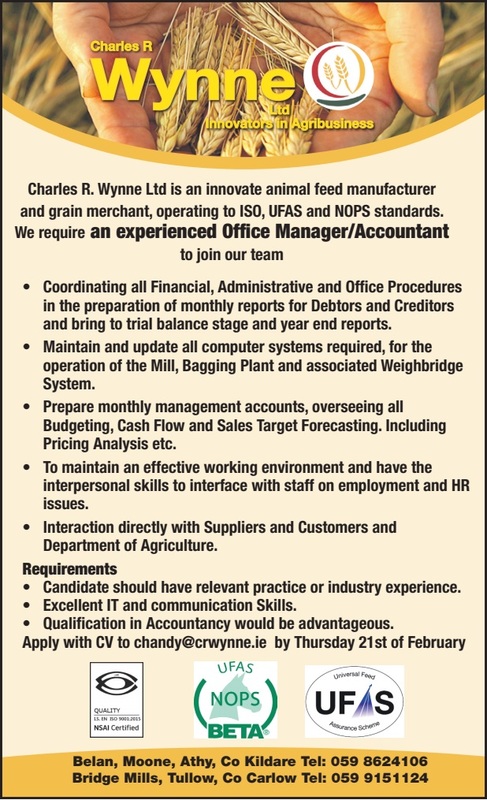 Charles R. Wynne Ltd is an innovative animal feed manufacturer and grain merchant, operating to ISO, UFAS and NOPS standards.They have a vacancy for an experienced Office Manager/Accountant to join their team. • Coordinating all Financial, Administrative and Office Procedures in the preparation of monthly reports for Debtors and Creditors and bring to trial balance stage and year end reports. • Maintain and update all computer systems required, for the operation of the Mill, Bagging Plant and associated Weighbridge System. • Prepare monthly management accounts, overseeing all Budgeting, Cash Flow and Sales Target Forecasting. Including Pricing Analysis etc. • To maintain an effective working environment and have the interpersonal skills to interface with staff on employment and HR issues. • Interaction directly with Suppliers and Customers and Department of Agriculture. The Candidate should have relevant practice or industry experience. Excellent IT and communication skills. A Qualification in Accountancy would be advantageous.